All bolts and screws that are needed are supplied with your purchase. You will need a 5/32" and a 3/16" hex wrench during assembly. Please take note: If you need to remove or adjust the kick pad on the buttstock a #2 square drive screw driver is required (along with the hex wrench). Pistol Grip: The original grip is removed by loosening and removing the screw accessible from the end of the grip. 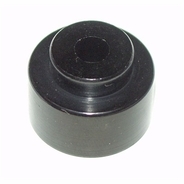 There is a small spring, called the detent spring, that must be removed from the original grip and inserted into a hole in new grip prior to reassembly. Carefully slide the new grip in place making sure the detent spring is in place. Complete the assembly with the new socket head cap screw supplied with the grip. Use a 3/16" hex wrench. Buttstock: When assembling the buttstock be sure to include the A2 buttstock spacer on the end of the buffer tube. Assembling without this spacer may result in damage to the kick pad. Remove the old stock by first removing the screw from the end of the original stock. Once the screw is removed, carefully slide the old buttstock off of the tube. There is a small spring projecting from the receiver that is held in place by the buttstock. The new buttstock slides over the buffer tube and the spacer. Be sure the spring is positioned properly and is not twisted or pinched while the stock is slid into place. A button head cap screw is already in place in the kick pad. This will prevent the stock from sliding completely onto the buffer tube until the screw is threaded into the end of the buffer tube. This screw can be turned and tightened with a 5/32" hex wrench inserted through the small hole in the kick pad. The front end of the buttstock interfaces tightly with the lower receiver -- you might need to press it into place. Before tightening the screw, carefully position the kick pad so it is perfectly flush with the stock. Take note that the screw holding the kick pad directly to the wooden buttstock has a #2 square drive head. If your AR does not have a standard A2 buffer tube then refer to the "Compatibility" page on this web site. Call or email Gene (316-393-4434 or gene@blackgunswood.com) with any questions.